Great Community Service Outreach by Central Patrol! “I need a Christmas miracle...this is Mr. Pena, a citizen friend in my beat who I check on time to time. He's a proud and strong 75-80 years old young man (he won't tell me his age lol). He needs a new wheelchair...anybody know anyone who may have a gently used one or somewhere I can find one cheap. The foot rest thingie is broken and he keeps hurting his feet (he's already healing from a broken leg) and the wheels don’t work well either. He was also asking if anyone knows anyone who maybe able to fix the hole in his roof and maybe help around the house a little. 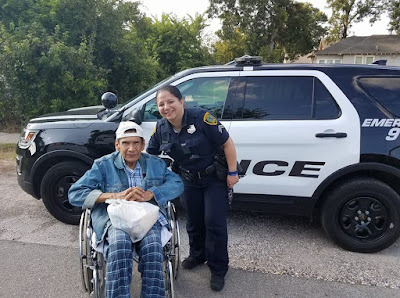 Officer Freeman was able to work with Officer Vogelsang of our Homeless Outreach Team to get a wheelchair for Mr. Pena. The HOT Tram also provided a warm jacket and blanket for Mr. Pena. Captain Guinn-Shaver of Central Patrol reached out to Walgreens located on Studemont and Washington and they provided numerous gifts (wheelchair cushion, cookies, pants, and socks) to make his Christmas one he will never forget. 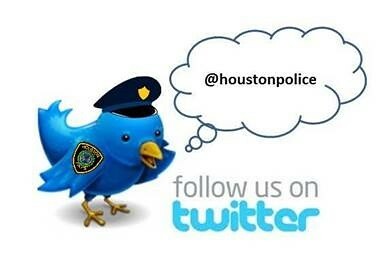 This is a great example of excellent community policing and using the tool of social media to assist our wonderful community. 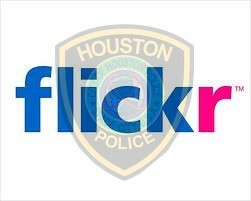 A Tribute to First Responders in the Aftermath of Hurricane Harvey . Chief Art Acevedo joined the parishioners of Our Mother of Mercy Catholic Church for lunch today. 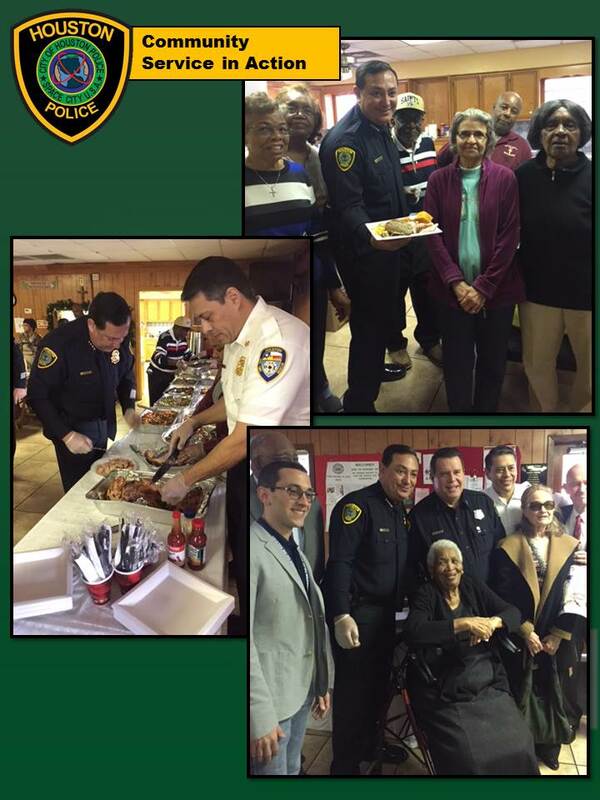 He and HFD Chief Sam Pena helped serve luncheon and spoke with residents about public safety. 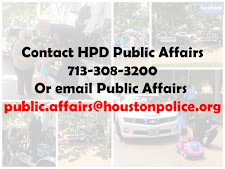 One of the main features of the new facility is a 2,300 square foot community room Mayor Sylvester Turner and several members of the City Council hosted Friday a grand opening ceremony for a new Houston Police Department (HPD) station that will cover the southwest section of the city. 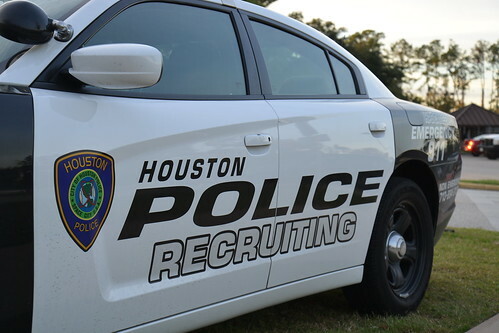 Lawsuit filed, investigation reopened into Houston infant's day care death Former apartment assistant manager accused of stealing $90K in rent payments Third ATM stolen by masked men from Marriott near Bush Airport Who was the Cypress gun range accidental shooting victim? 5 tips to keep from feeling sleep deprived Too much stuff in storage? 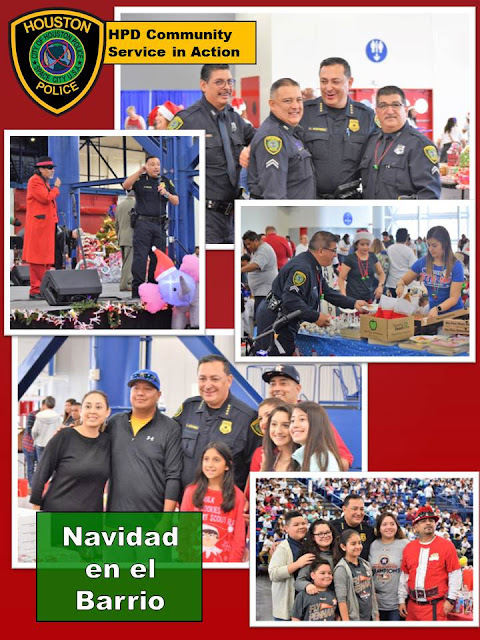 The Southwest Division Community Service Officers paired with Walmart and the Rice School La Escuela Rice to host our 1st annual Shop with a Hero. The Rice School selected 25 deserving students to participate in the event. 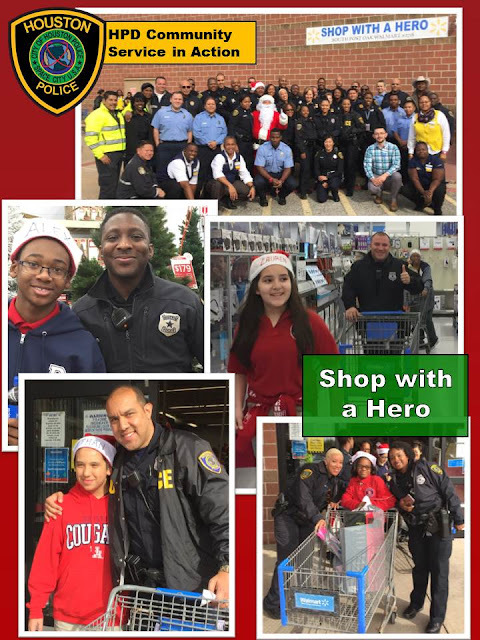 The students were paired with a local police officer, fire fighter or teacher and given the opportunity to spend their $100 gift card. It was an outstanding event and one that Walmart has committed to hosting again next year.